The purpose of this arts-based special initiative is to build meaningful connections between student teachers from McGill’s Faculty of Education, Department of Integrated studies in Education, and Montreal youth. The arts-based workshops will engage youth in different forms of artistic expression. The aims of that engagement are to develop motivation, collaboration, leadership, expression, creativity and confidence. The youth participants will design, develop and share their own art endeavours within a particular arts-based domain while working collaboratively and constructively with their peers. The McGill student teachers will benefit from authentic experience with their surrounding community. They will develop meaningful relationships with young people who may not reflect their own lived experience. 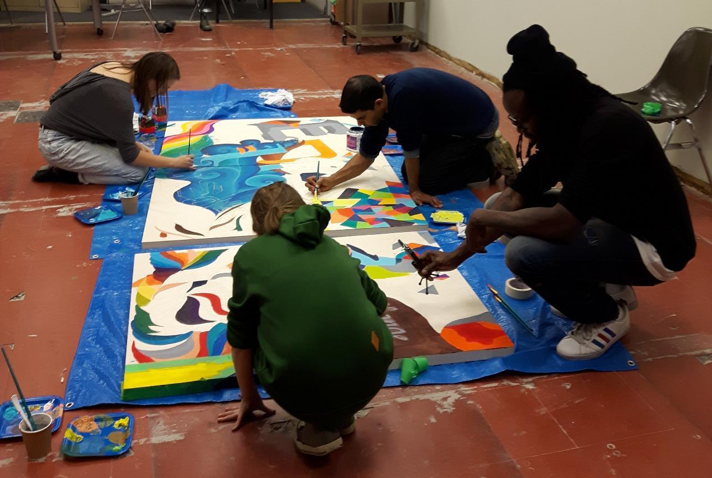 Their teaching skills will be informed and reinforced by what they learn in regards to connecting with youth from varying backgrounds, and using art as a means for motivating all young people in formal and non-formal learning contexts. 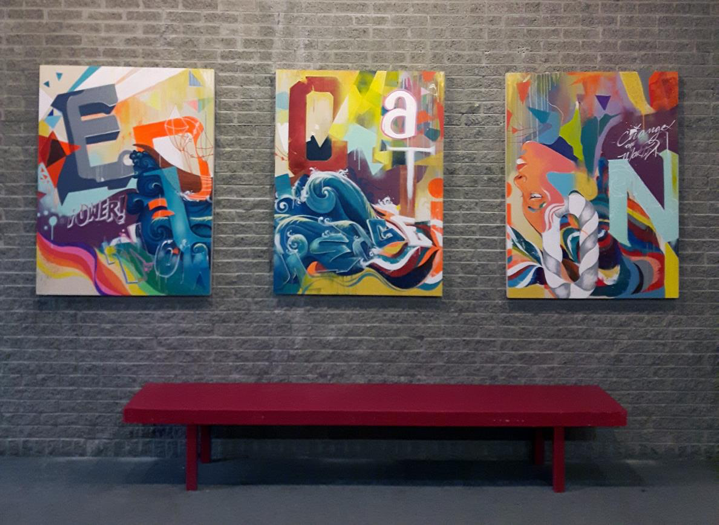 For more information about Jimmy’s other artwork, see Meet Jimmy Baptiste, Artist in Residence or visit his website: http://jimmybaptiste.ca/. My name is Chloe Corrado and I’m a second year student in the B. Ed. Kindergarten and Elementary education program. This year, through the special topics course taught and facilitated by Dr. Benson and Jimmy Baptiste, I hope to explore a variety or art techniques and projects with the children that I will have the opportunity to work with. The first workshop that I am working on is a large scale self portrait that each student will have the chance to produce, through which they will have the opportunity to explore their features, both physically and emotionally, in order to produce a colourful art piece. Not only will this encourage students to explore artistic approaches that they haven’t used before, but they will also have the chance to play around with lots of fun artistic methods! Hello colleagues and peers, my name is Jane Ding and I am a student at McGill University studying in the education program of kindergarten and elementary. The workshop that I am currently working on aims to bring students closer together as a team through the creation of self-portraits constructed from cut and paste materials from recycled magazines. The purpose of the project is to help students interact with their peers by introducing themselves to the other and explain their interests as to why they chose to cut out a particular image from the magazine. Hopefully, through this activity, students can get to know other cultures and the interests of their peers. Born in Ukraine and raised in Montreal, I am a second year McGill University student in the Kindergarten and Elementary program in French Immersion. I always had a genuine interest for all types of art and especially on how people view and use art today. I enjoy drawing unrealistic portraits and face paint various characters. For curious minds, some of my works can be viewed on Instagram through the user Sandaeva. My art project consists of creating a collective mosaic on a meaningful topic for the participants. The topic will be something that the teenagers would want to discuss about, sensitize their peers and interpret their view on paper. Using their own artistic style, the artists will each complete a piece of the artwork that we will assemble with the other pieces at the very end to create a brilliant chef d’oeuvre. My name is Jaereem. I am in the U2 of University of McGill’s Kindergarten and Elementary program. Recently, I was lucky to be part of in EDEC300 – Special Topics Class. This class allows students to learn through Community Service-Learning. It is an experiential, hands-on learning, which allow students to learn through actions, reflections and real-life engagements. For my Special Topics Class project, I would like to focus on therapeutic art activities for youth. It has been proven that art activities help to decrease stress and manage healthy mental health. Hence, through art activities, such as colouring, drawing, pointillism, and mosaic art, I want to promote simple, yet effective stresses management skills, and revitalize healthy mental state and self-care. Hopefully, this unique Special Topics project will enrich youths’ community service experiences through my supports, and challenge me to develop new skills and cultural awareness in a real-world setting. In this artwork community-based project, students will be asked to sketch and color their role models. Students’ role models may range from their own parents or family members to people outside their community, i.e. famous celebrities, etc. Curl, K. (2008). Assessing stress reduction as a function of artistic creation and cognitive focus. Art Therapy, 25(4), 164-169.